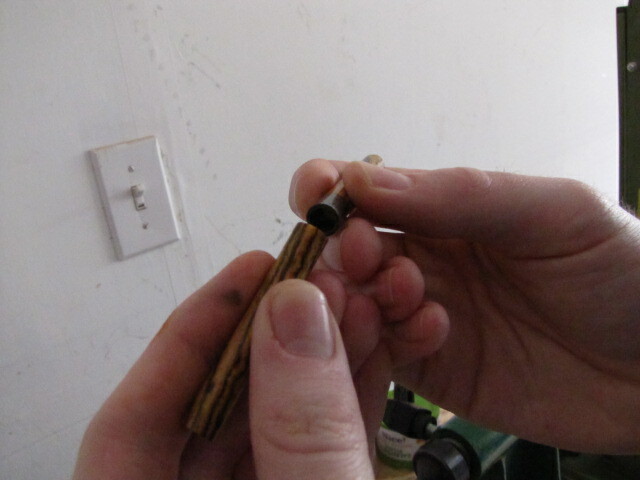 We’re also going to use our pen mill, a paper towel, and a piece of sandpaper to remove excess CA glue from the edges of our barrels. If that doesn’t make sense now, don’t worry. I’ll show you exactly what I mean in this section of the tutorial. We’re just a few minutes from done, so let’s get down to it! 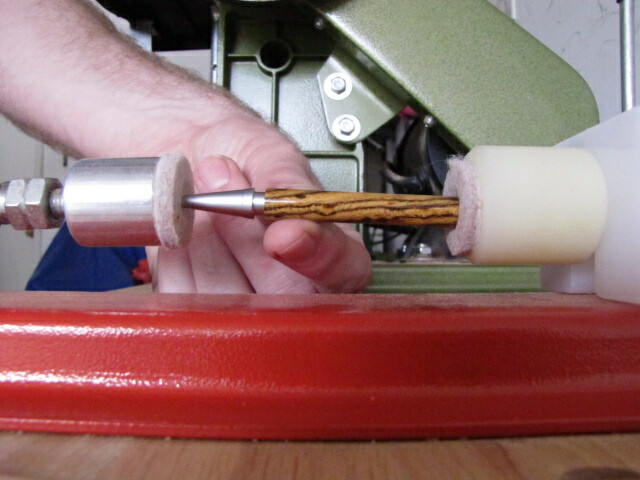 Scroll to the top of this page and click “Step 1” to read about dismounting your pen barrels from the lathe. Before you completely discount this section of the tutorial as worthless, hear me out. 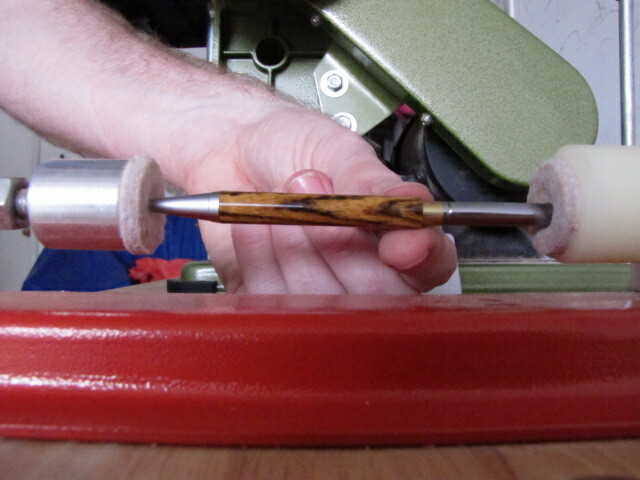 If you’ve never dismounted slimline pen barrels from the lathe after a CA finish – it’s different. Just hang in there for a couple of pictures and I’ll show you how. Doesn’t it just put a smile on your face?! Well, the picture of MY finished barrels may not, but it definitely will when they’re yours 🙂 Yup, I used an emoticon. That’s how happy those pen barrels make me. 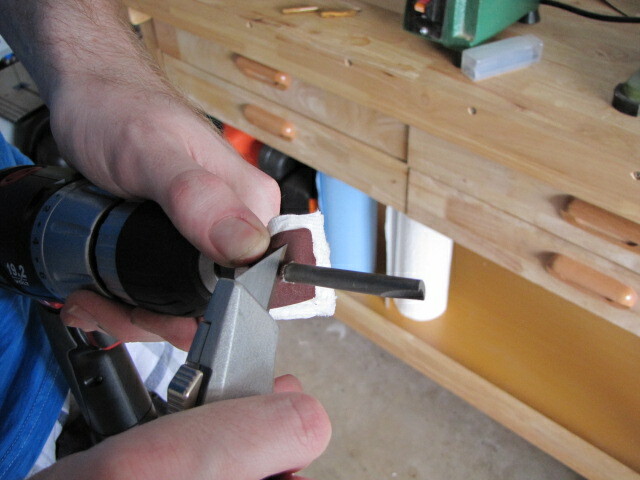 Unlock your tailstock and slide it away from the mandrel. 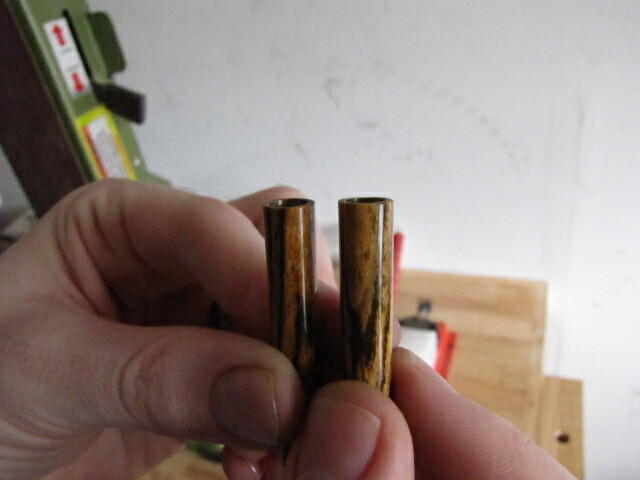 No reason to panic though, just hold your blanks firmly on the end and push the bushing to one side. Think about it like a graham cracker that you are hoping with every fiber of your being breaks perfectly even. It’s kind of a scary moment, but I’ve never had this technique backfire on me. Ta-da! 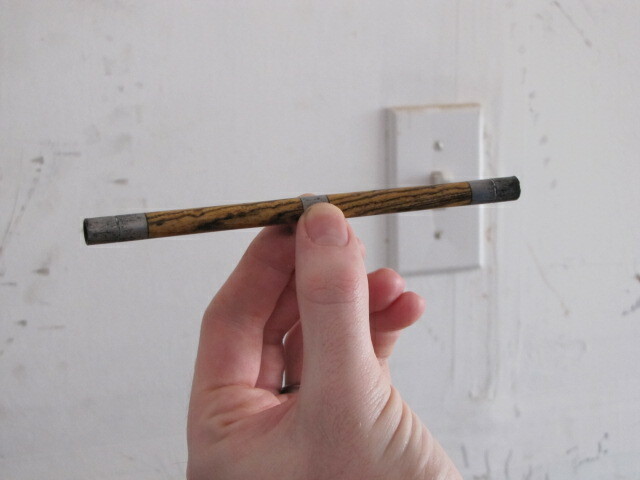 Now you’ll probably notice after you’ve snapped all of the bushings off that you have excess CA glue on the ends of your blanks. No worries though, this is an easy fix! I’ll show you exactly how in the next tab. Scroll to the top of this page and click “Step 2” to read about removing excess CA from your pen barrels. 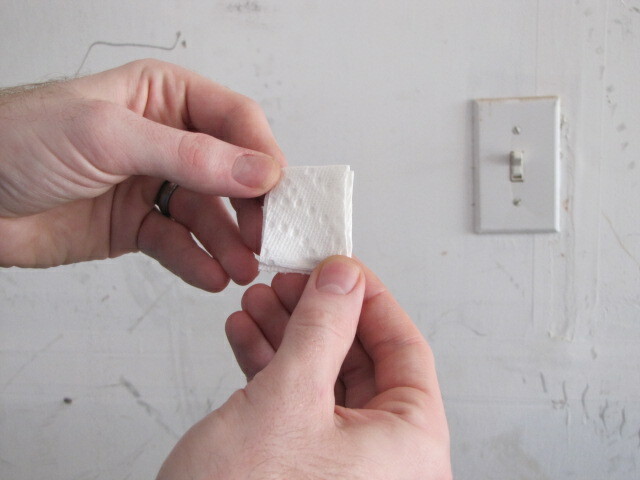 Start with a piece of paper towel, folded into about a 1″ x 1″ square. No need to be perfect here. 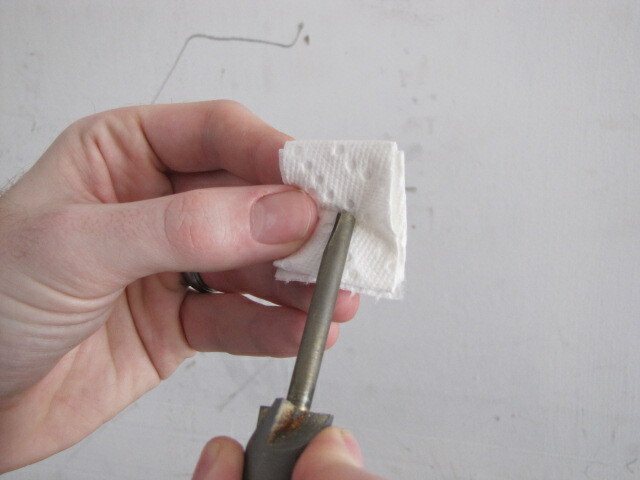 Press your pen mill through the center of that paper towel square. Again, no need to be perfect here. Just eyeball it. 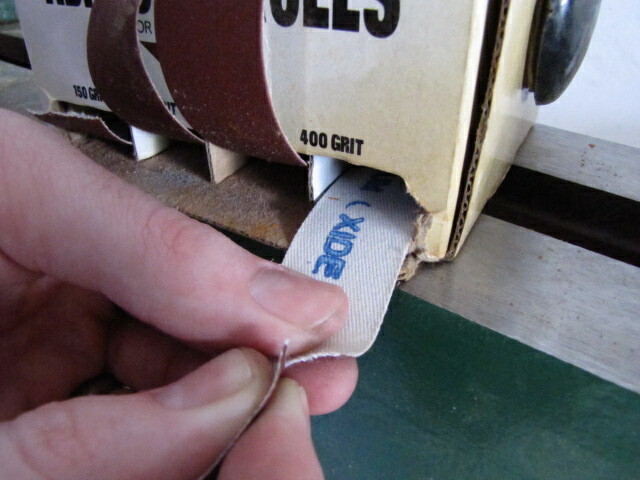 Next, tear off about an inch of the finest grit sandpaper you have on a roll or sheet. For me, it’s 400 grit. And press it through your pen mill, resting it on top of the paper towel. Be careful here! 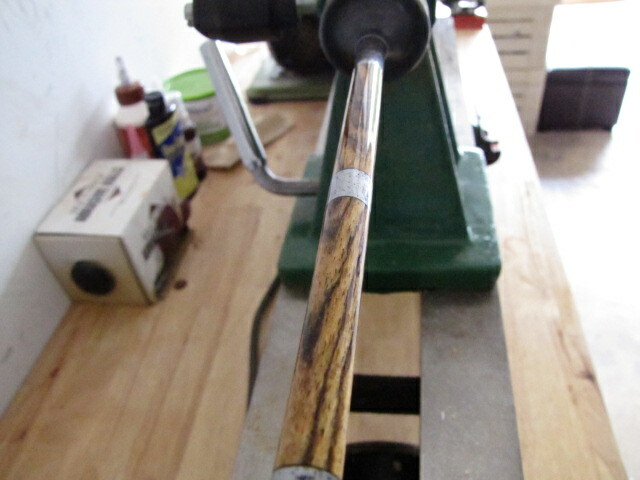 The end of that pen mill can be pretty sharp. Now we’re almost done here, but do you see how there’s a little bit of sandpaper kind of “sticking out” over our pen mill? 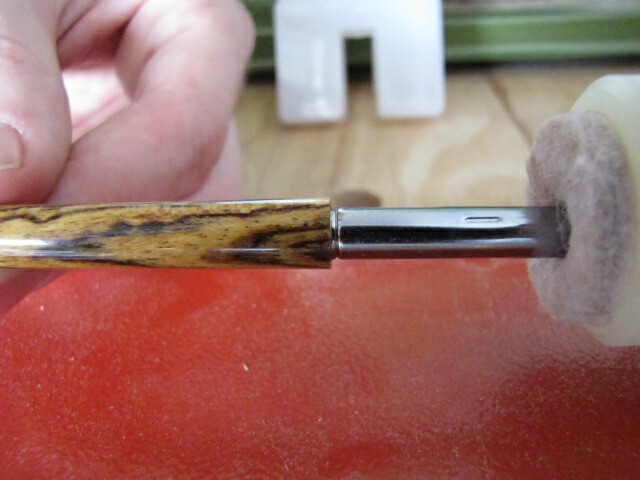 We need to shave that off and have a perfectly flat surface for sanding our blanks, and to do this I use a box cutter. Again, be careful here. And voila! You have a completed excess CA removal tool. It’s not too pretty, but it’ll get the job done. 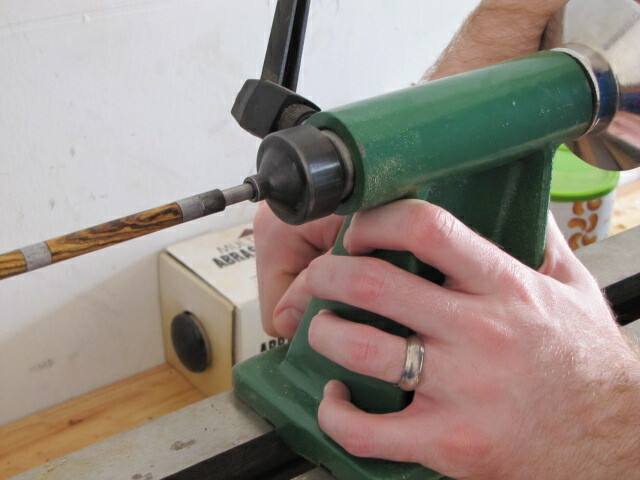 Slide your first blank down the shaft of the pen mill, and cut the drill on for 3-5 seconds. You don’t want to remove too much here – just the excess. 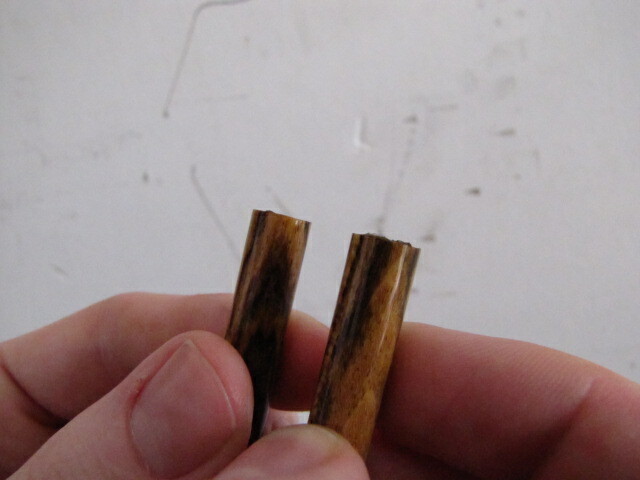 Pretty different than the jagged edges we had after snapping the bushings off, right? 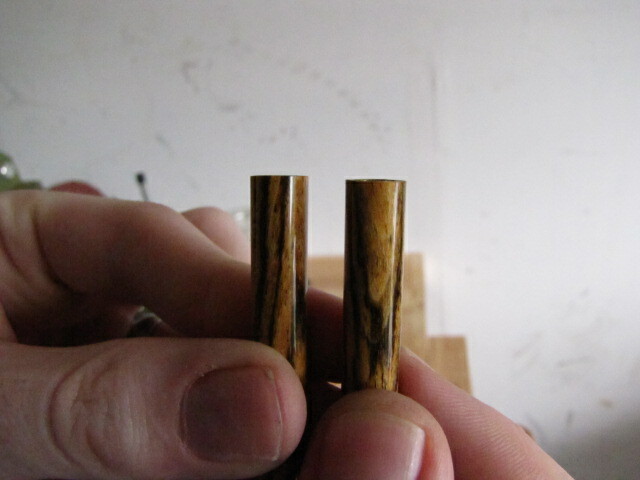 Now your pen blanks are properly completed barrels, and it’s time to move on to final assembly. 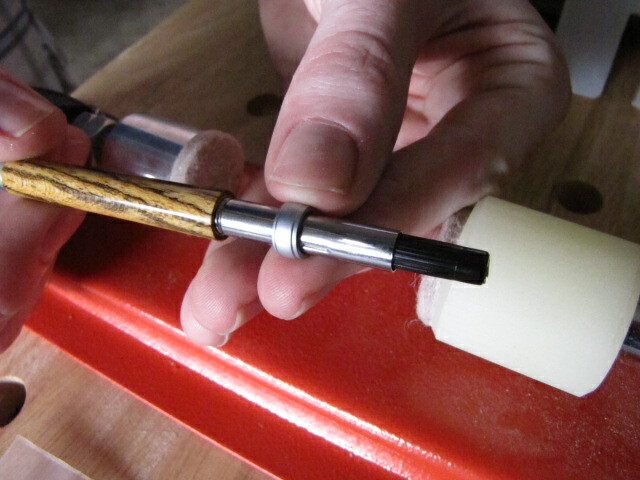 Scroll to the top of this page and click “Step 3” to read about final assembly of your slimline pen. 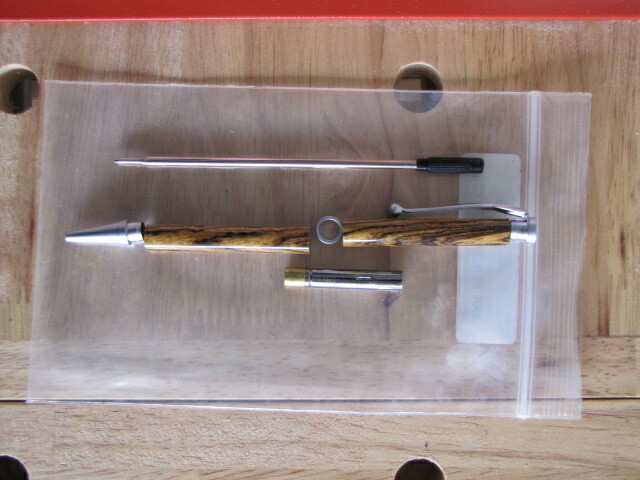 Start by laying out all of your pen kit accessories along with your blanks. 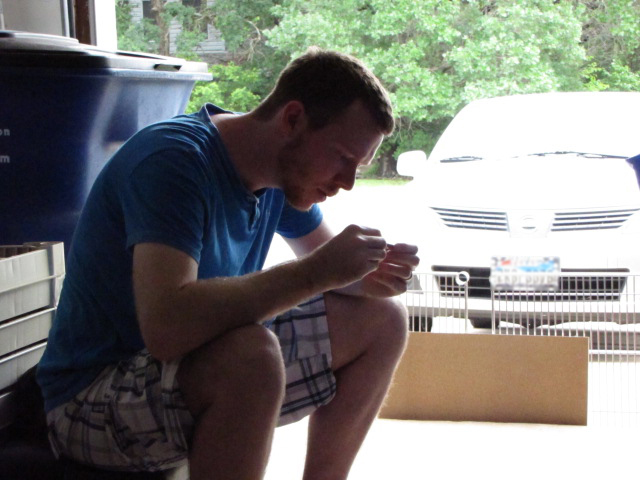 See that focused, confused look on my face? Don’t let that be you. 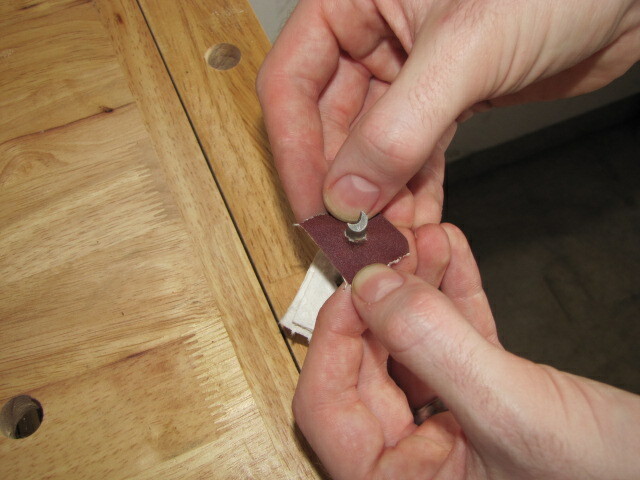 Once you’re sure you’ve got your grain matched up, we’ll start by assembling the cap. Slimline pens are extremely easy to assemble compared to some of the more complex, more expensive kits, but there’s still margin for error. Pay close attention as you go along because it’s a shame to have to disassemble everything and start over again. 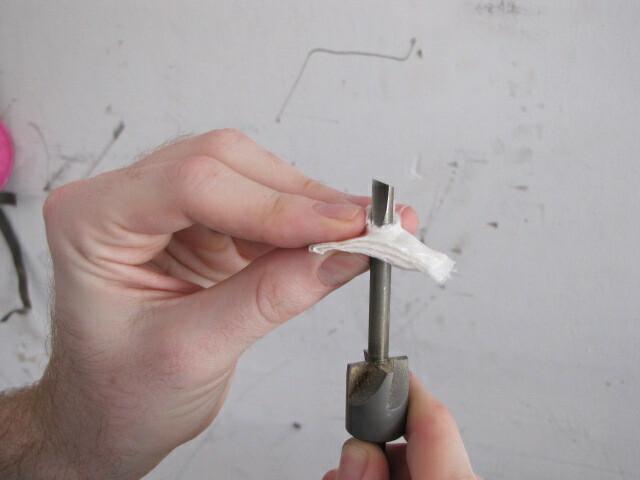 Begin by putting the button of the cap through the clip, and pressing it into the end of your cap. Side note: You’ll notice that I have little felt pads on both ends of my pen press. I put those there myself to ensure I don’t damage any components of my pen kit. See how I’m holding the clip in place as I press? 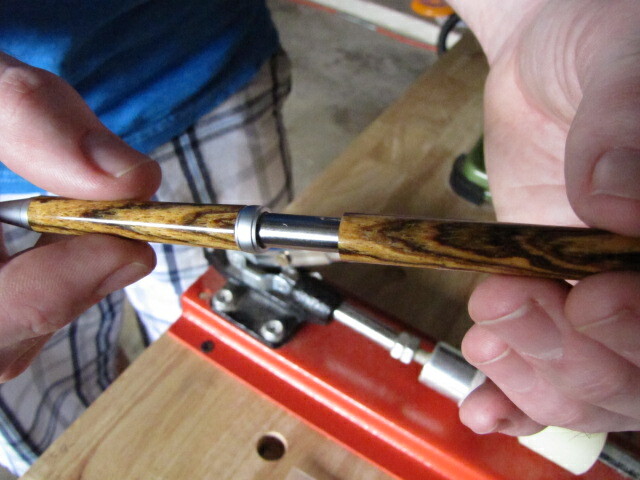 It’s also extremely important that your barrels are perfectly straight when being assembled throughout this entire process, otherwise you’re at high risk of cracking your blanks. I can’t tell you how many times I’ve heard that dreaded “click” and had my heart sink because that is the moment that my pen is no longer perfect. 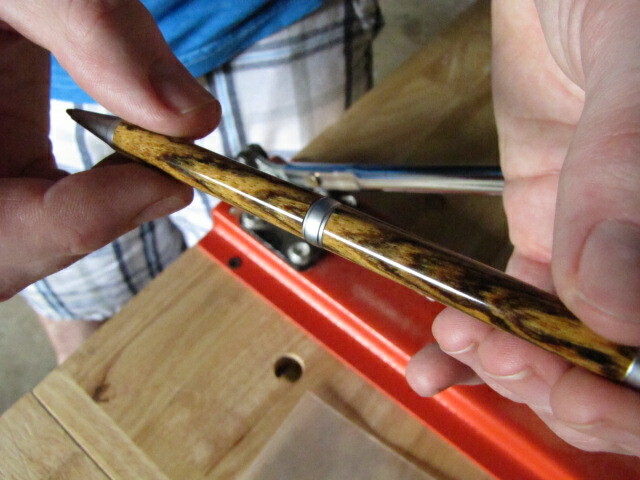 Even the slightest angle can cause your pens to crack during assembly, so be very careful. That’s it for the cap! Time to move on to the front assembly. 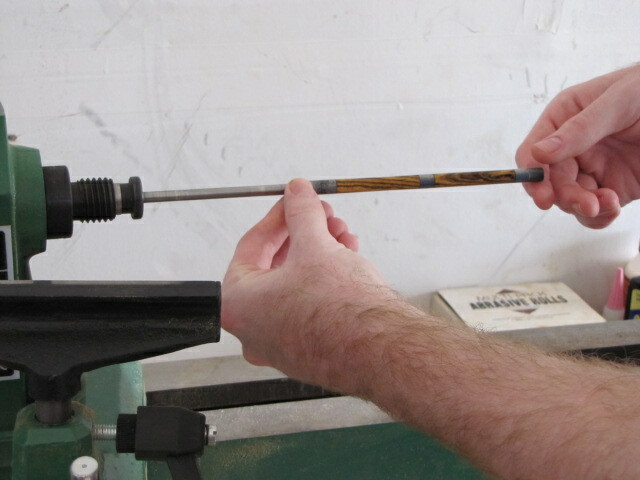 Start by pushing the tip into the front of the blank. Again, notice how I’m holding the barrel just behind the end to help guide the pressure. Notice how perfectly flush that accessory is against my barrel. You can’t get consistently flush results like that without a digital caliper. It’s tedious, but totally worth it when you have your pen kit accessories flush up like this. 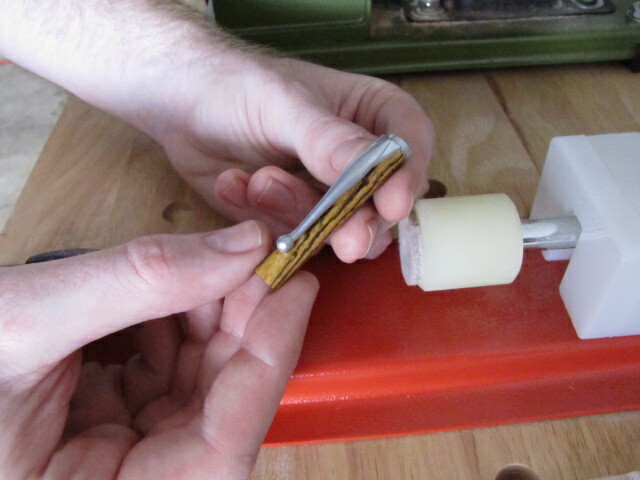 Next, press the twist mechanism into the back end of that blank. 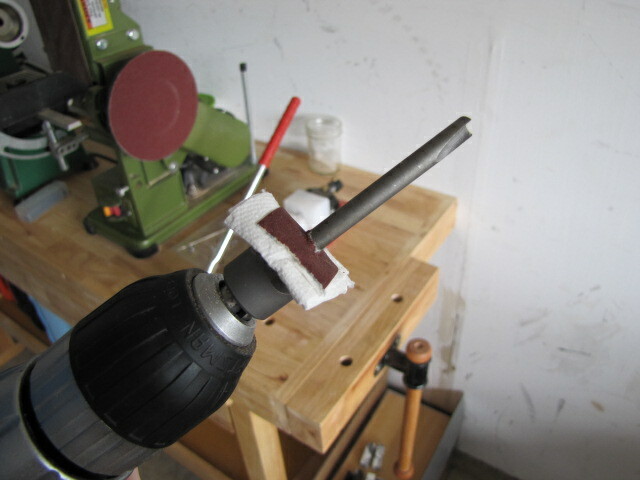 I usually stop about 1/16″ shy of the line because I’ve taken off a little brass when sanding/milling. It’s easy to press it in a little further if you screw the ink cartridge in and find that you’re a little short, but MUCH more difficult to pull it out a little if you go to far. Moral of the story: always stop a little shy and check before pressing all of the way to the line. Then screw in the ink cartridge to see how far the tip sticks out. I’d say that’s about perfect, so it’s a good thing I stopped shy of the assembly line. Otherwise I would have been tossed into a world of frustration trying to disassemble the front of this pen. 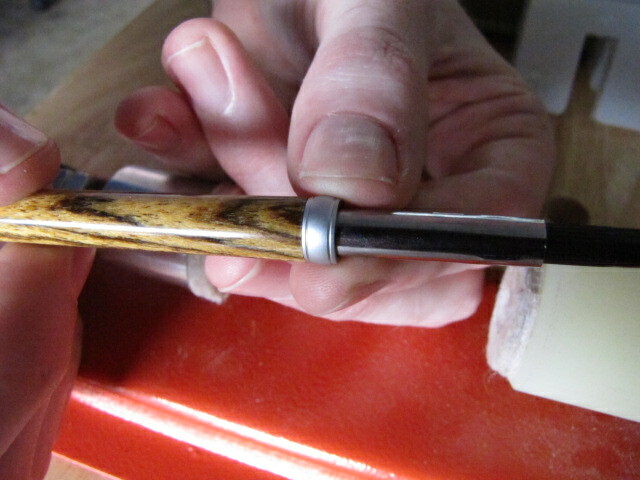 Now slide the center band over the twist mechanism. 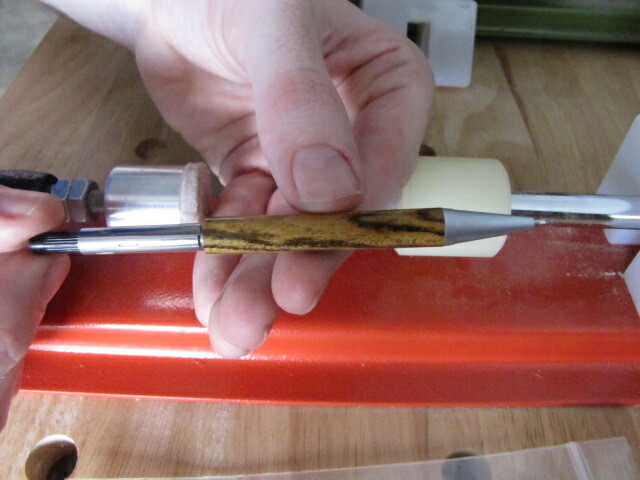 And press the cap on, twisting it around for your perfect grain match. 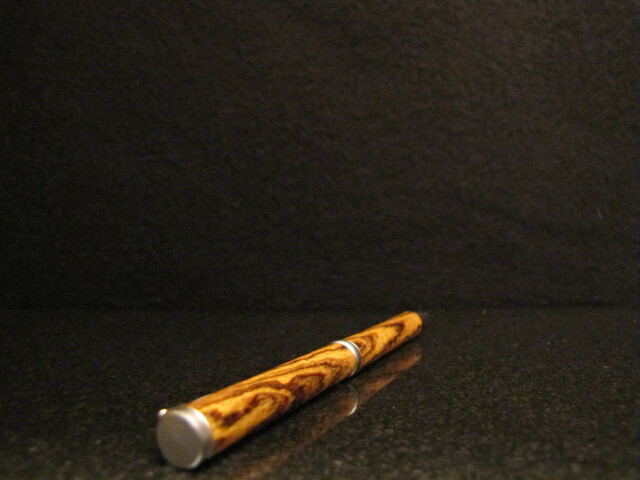 And there you have it, a perfectly flush, beautiful, handmade wooden pen with a glass-like CA glue finish. Phew! If you’ve followed this tutorial all of the way through, you’re probably pretty exhausted. It’s taken me over a month to put this tutorial together from start-to-finish, so I’m pretty exhausted too, haha. I sincerely hope you’ve found it helpful, and would greatly appreciate you sharing it with friends and fellow pen turners if you’ve found it at all helpful. I’d also love it if you left a comment on the tutorial home page or on my “About Me” page so that I know you were here and that you went through it. Thank you so much for your time and attention. I know it was probably a bit too thorough at points, but I wanted to make sure there was a pen turning tutorial on the internet that laid out every fine details. 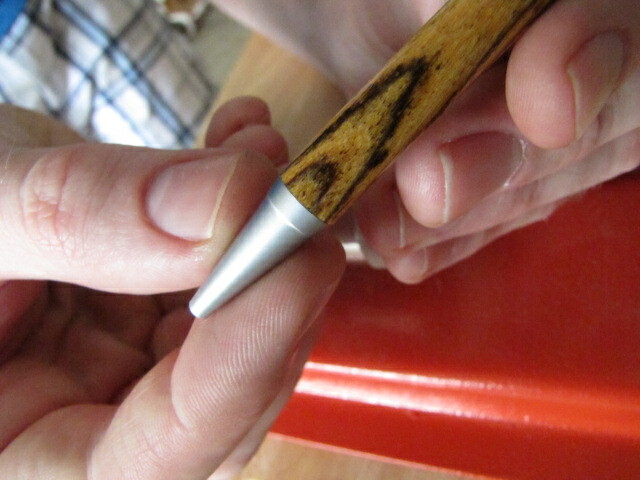 Now with a little practice, even novice pen turners can turn pens like the pros! Best of luck to you all, and happy turning! Good stuff, a few new things I’ve never seen before were interested like the sandpaper drill rig. Thanks for putting the time into this with clear pictures. No problem at all, Roger! I’m very glad that I could help. Thanks for taking the time to look over a few things and leave a comment to let me know you stopped by. Nice one Ian. 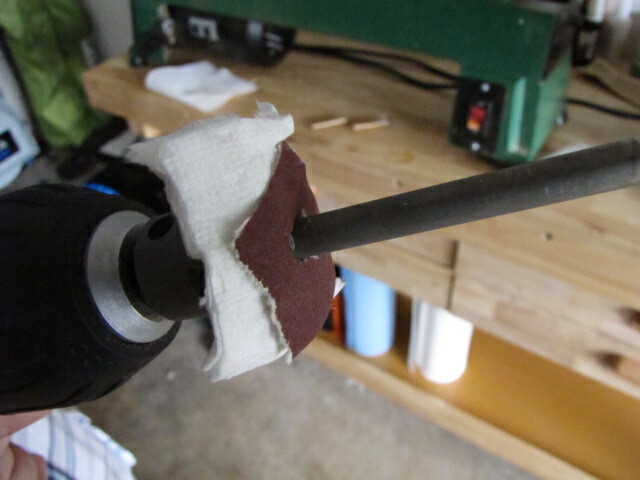 I do 2 things different – my lathe speed for sanding is on the slowest (no heat build-up), and i put the CA on with the lathe running on the second slowest speed. Only recently got my hands on the micro-mesh paper – it works wonders. No need for buffing when you got this! Hey Henk, thanks for stopping by and sharing some of your personal touches! I’ve sanded on low before but (for obvious reasons) the sanding stages took almost twice as long. 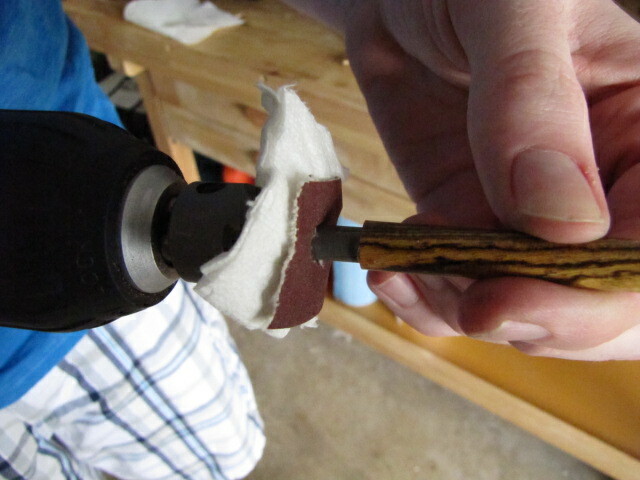 Do you see any other advantages from slower sanding besides less heat buildup? 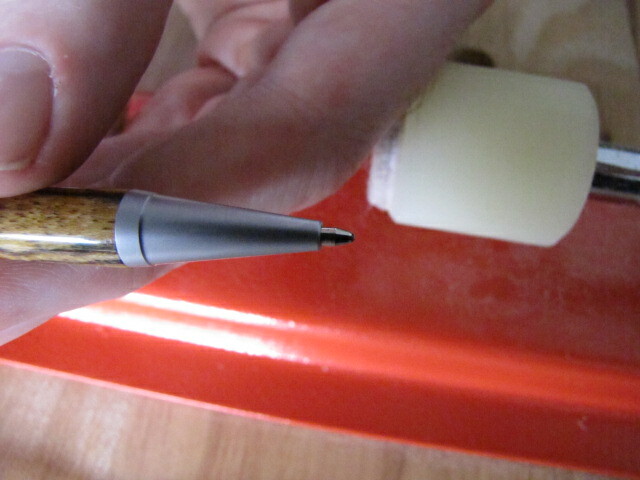 And I agree – micro-mesh has really changed the finishing process of my pens since I acquired it a couple of years ago. Thanks again for taking the time to read and leave a comment – I always love hearing from the people that have stopped by. Great Tutorial! I appreciated the good clear pictures and the detailed explanation. So many times people will leave something out thinking “everyone knows that”. I am not sure I have reached the level of patience needed for this process or found just the right blank to put in the effort. Thanks for all your effort in putting this together. No problem at all, Ed! I’m very happy to hear that you found it helpful. Thanks Ian for one of the best tutorial jobs I have ever seen on the internet. I just inherited an old cast iron Rockwell Delta lathe and just as soon as some of the new parts I had to get arrive, I plan on giving pen turning a try. Hopefully I will be successful and your instructions will help a lot. I have already sourced all the items you write about except for the micro-mesh but I will find that soon, any help on that? I ordered 100 blanks of common woods to give me a stock pile to learn how to turn properly and if I’m lucky I’ll be making some pens out of it in the next week or so! Thanks again, Good Stuff!!!!! I’m really glad you found it helpful, Danny! It sounds like you’re about to set out on a real pen turning extravaganza with 100 blanks, haha! Regarding the micro-mesh, I typically buy it on Amazon (I think I linked to it in that stage of the tutorial) but you can also buy it from Rockler, Penn State Industries, or your local Woodcraft store if you have one! They’ll just usually be a little bit pricier. I’m quite new at pen turning, and I’m still learning a lot. Your tutorial will probably fix one or two little problems I had (best speed for sanding for example) and I now feel confident enough to try some CA finish. Hey Francois! I’m really happy to hear that! Thanks for reading over some of the tutorials and taking a minute to let me know you found them helpful. Best of luck! Thank you very much for this detailed tutorial. 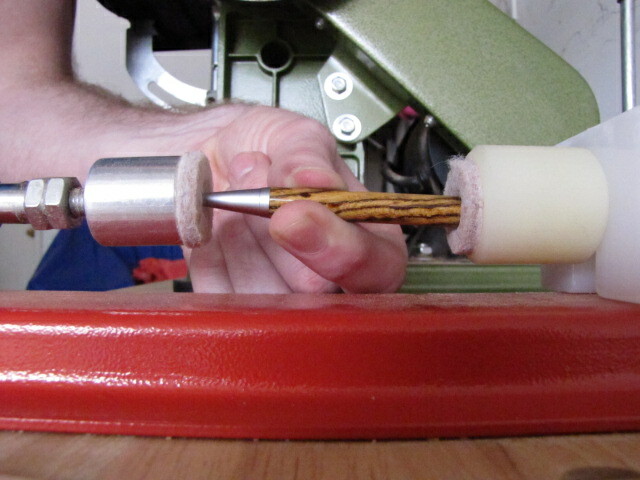 I am new at pen turning and have researched the internet for answers to a number of questions. I was able to find bits and pieces of information in various sites. It was frustrating and time consuming. Now with your tutorial I have all the answers that i needed and I go back and frequently to reconsult your fine tutorial for answers to problems as they come up. It has been a great help and has made my new passion a most pleasant experience. 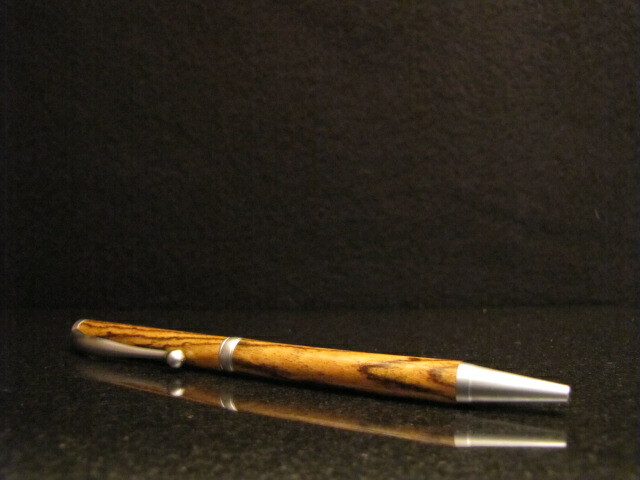 I am a 61 year old retired guy that was looking for something to do.I figured I’d try turning pens. I bought a lathe yesterday (same model you have) and have been looking at different videos etc. in order to find out just where to begin. I ran across your tutorial today and I must tell you that for an absolute beginner like me this is the best site I have found so far. I really appreciate the links to the items and tools you mentioned and your tips. Really excellent work. Thanks. Now I know where to start and how to get going. I would like to put a logo on a pen using a decal. 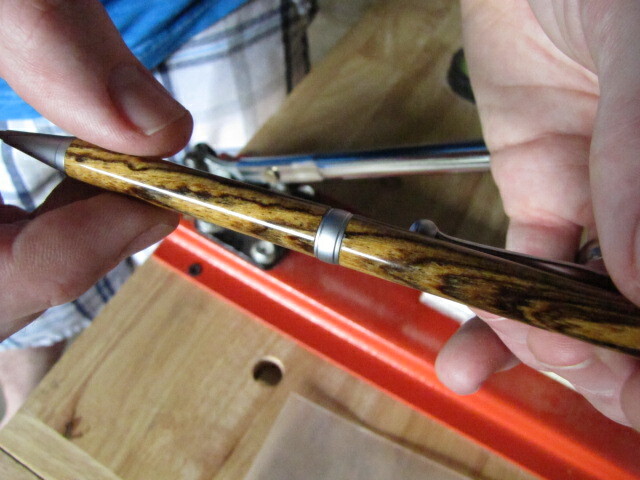 Do I have to turn the pen to a smaller diameter than the bushing and then build it up to make sure it’s the same size after applying several coats of CA? I assume I have to put 4-6 coats before the decal and then 6-8 after. I can’t seem to find any references to how this part is done so any help is appreciated. A very comprehensive tutorial! 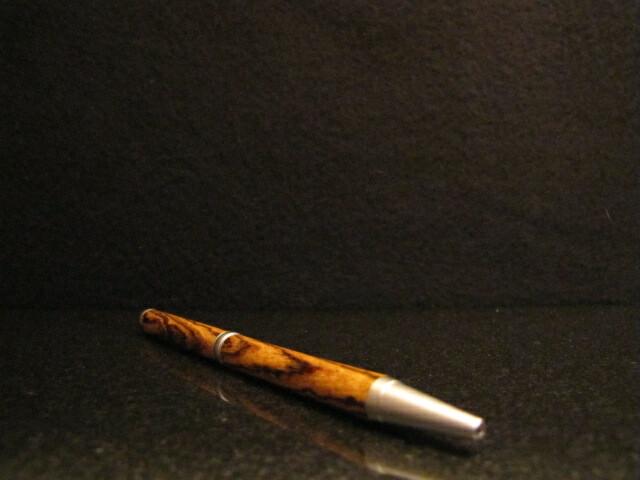 I learned a lot and was able to make some really nice pens afternjust a few tries. I would have messed up many more had I not seen your tutorial first. I have a question, though. Have you encountered cloudiness in your finish when using CA glue in combination with shellwax? I was able to get a mirror glas finish on walnut which was beautiful in all respects – except that there is some slight grey cloudiness at places. the cloudiness seemed to increase as I applied coats. 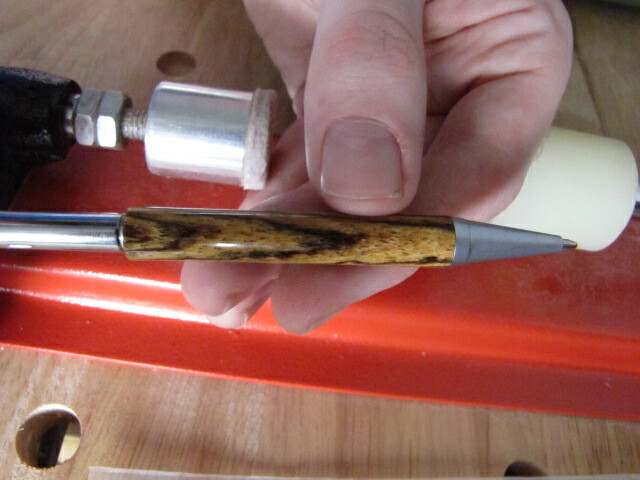 I was able to reduce, but not eliminate the cloudness, by rubbing out the finish with tung oil. Excellent detail, not many would put this much effort in creating a tutorial. 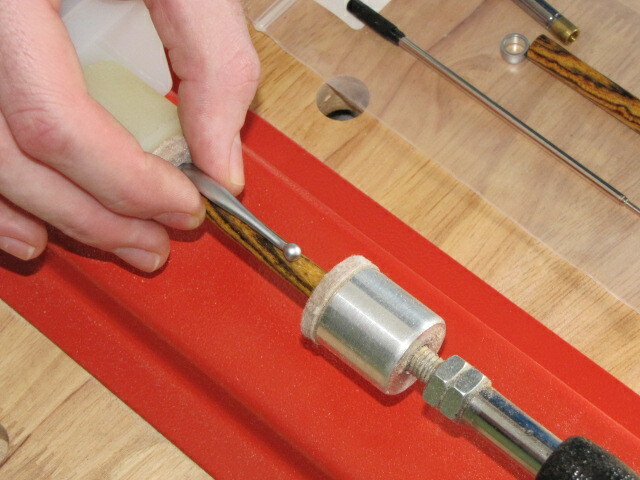 The need to trim the CA glue from the ends of the blanks can be eliminated by using – Non-Stick Pen Bushings for CA Finish -. Amazon has them, but I got them at a Rockler store. 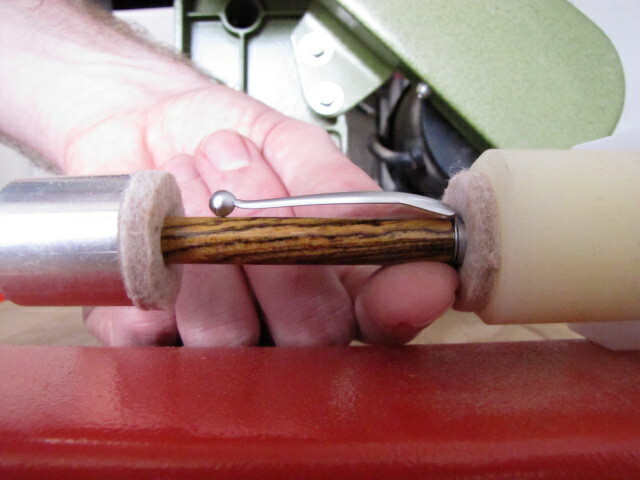 With proper application of the CA, there is no build up on the turned ends because the bushings are tapered; they don’t meet flush with your turned blanks. You just swap them out for the metal bushings before you apply the CA. As long as you don’t get sloppy with your application of the CA, you won’t have any of the problems people write about in the reviews. Very nice tutorial! I encouraged my teen son to start turning pens and your site gave me all the ammo I needed to be that annoying mom with all the tips and suggestions I picked up! Seriously, though, we have referred to it all day as we completed our first pen and could not have asked for a more clear and detailed guide. Thank you for taking the time to create a great step-by-step to share your love of this. Wow what a great and very comprehensive tutorial! 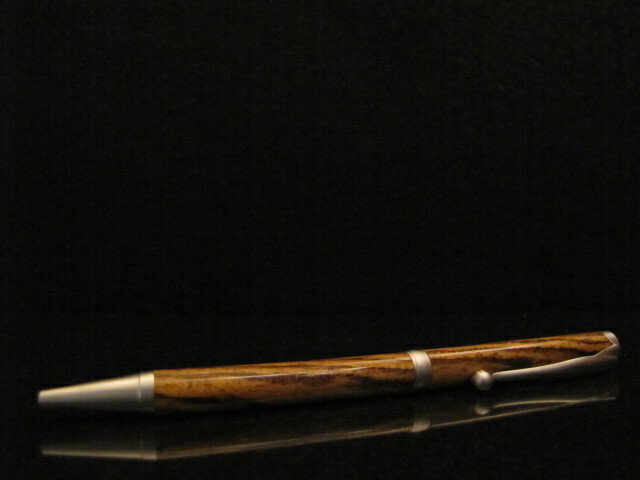 I’m an avid wood worker that has always been interested in turning. So I will be starting this “new phase” now. I purchased a basic kit from PSI, but already saw here I might have to get a few goodies to make my time easier. Thank you so much for taking the time and making a great in detail, step by step like this. Excellent, excellent JOB!! Thank you very much, Dom! I’m glad you found it as helpful as I intended when putting it together.